Hormann doors ... conform to British standards. Hormann Middle East says 2015 has been the best year for the leading European supplier of doors, which has boosted its portfolio by adding prestigious projects and launching innovative products in the region. More and more gates, doors, frames and operators in the market today carry the Hormann name, making the company a leading provider of such products. 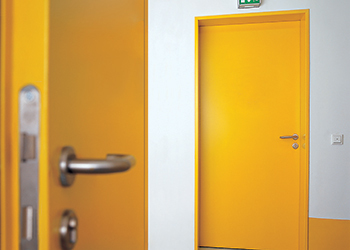 Its product range includes well-known classics like rolling shutters, high-speed doors, sectional doors, door operators, controls, loading technology systems, fire and smoke-tight door assemblies, entrance and internal doors, canopies and frames. Hormann Middle East managing director Darius Khanloo says Hormann has witnessed double-digit growth in business, with 2015 having been the best year “by far” for the company in terms of turnover as well as in percentage increase as compared to the previous year. Hormann has completed many prestigious projects in the UAE and region including the new Lamborghini showroom in the UAE, the new Trolley Dubai project, among others. Among its most prestigious projects is the Bvlgari Hotel at Jumeirah Bay Island in Dubai. Bvlgari Resort and Residences Dubai is the world’s fifth Bvlgari Hotels and Resorts property. The resort will comprise 100 rooms and suites in the main hotel buildings, as well as 20 hotel villas and a full range of luxury hotel facilities, inclusive of the signature Bvlgari Ristorante and Spa. Each home at the Bvlgari Residences has been meticulously designed to create efficient living spaces. The project, contracted to Alec, is expected to be completed in August this year. ALR67 Thermo profiles ... optimal thermal insulation with natural light. 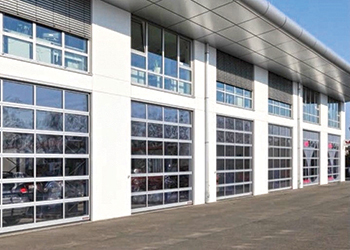 In terms of new products, Hormann has launched ALR67 industrial sectional doors for the industrial sector and ALR 67 Thermo aluminium profiles with a thermal break that offer optimum thermal insulation while letting in maximum natural light. The ALR 67 Thermo with optional climatic glazing and ThermoFrame decreases the thermal insulation value by 55 per cent to up to 1.6 W per sq m K in comparison to the ALR F 42, he says. It is also planning to launch the assembly of three types of high-speed doors, namely V5015SEL, V5030SEL and V6030SEL. Hormann set up its first Middle East plant in Jebel Ali Free Zone in Dubai in 2009 and currently has offices in Dubai and Qatar. It has 7,000 sq m of warehousing space and offices and employs 50 staff in the region. To cater to the increasing number of projects and boost its presence in the region, the company invested in a new building in 2015. The new facility – which was officially inaugurated by Christoph Hormann, general partner of Hormann – includes an extensive showroom, offices, warehouse and assembly plant in Jebel Ali Free Zone. The showroom displays the company’s latest products including garage doors, sectional doors, rolling shutters, domestic doors, amongst many others. It is fully interactive and allows customers to experience the functionality and user-friendliness of Hormann products. To maintain its market share, he says, the company has taken measures to ensure local products availability by increasing stocks along with the local assembly. Its main goal is not only to offer the ‘right’ price, but also achieve quick delivery. Furthermore, Hormann aims to continue to increase its share in its established markets, with a greater focus on after-sales and service activities. “We want to assure our customers of our continued support even after the handover of a project with proficient after-sales services,” Khanloo adds. Hormann has also started penetrating the markets surrounding the GCC such as East Africa, Egypt, Iran and Pakistan. So what is Hormann’s strategy for success in the region? “By setting up and investing a substantial amount of money in our business here, our vision is to be a strong market leader in the Middle East. Although we are a family business, we never look for short-term profits; we would rather invest with a long-term perspective to maintain business relationships. “Even if we produce in Germany to maintain our high quality standards, we are able to set a reasonable price with a short delivery term. We like to position ourselves as a high quality manufacturer with a fair price strategy for small, medium as well as big projects. Rather than the size of the projects, what matters most is to maintain our reputation in our area of expertise,” he concludes.